shortlisted by New London Architecture for a Don’t Move Improve 2016 award. 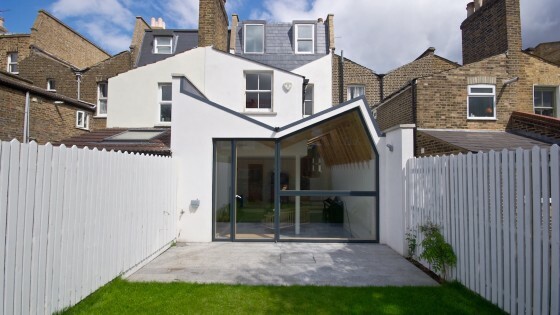 A modern interpretation of the London Roof it provides a modern and unique language for the rear of the mid terraced house. The roof structure is expressed as exposed timber rafter with a plywood ceiling which adds a simple but natural warmth to the interior. The roof construction avoids the traditional roof construction of slate tile. Instead, a single polymeric roof membrane is used to provide a well insulated lightweight warm roof construction. As part of the reconfiguration works the kitchen has moved into the middle of the house floor plan. A new open plan galley kitchen provides a better connection between the lounge to the rear and the dining room. The dining room is now orientated for the early morning sun-rise to the East and ideal for breakfast. A large hexagonal glass window frames views of the small urban garden from the living room to the West.